I've been looking forward to posting this since Saturday. [rubbing hands together gleefully] So let's get to it! The setup: What do you think would happen if two bakeries received the exact same phone order, but interpreted in two very different ways? That was the inspiration Paul of Jet City Cakes had when he and Matt from Starry Nights Catering got together to provide the cakey goodness for our signing at Third Place Books in Seattle. Next, here's Paul's order form. Do you see the tiny difference? The fabulous thing about this collaboration is that it allowed Paul and Matt to work to their strengths. As you can see, Starry Nights does more elegant, traditional work, whereas Jet City really shines with the crazy, sculpted designs. By the way, both of these guys are up for The Best of Western Washington awards in the Evening Magazine. Click here to vote for Jet City, which is up for best cake shop, and click here to vote for Starry Nights, which is up for best caterer (login required). [announcer voice] But wait, there's MORE!! How about some cupcake Wreckplicas? You can view all of the entries on the CW Facebook page here. Thanks to all of you who came out, the Third Place Books staff, our fantastic driver William, and of course Paul and Matt! John and I had a fantastic time in Seattle thanks to all of you! That is hilarious. Please tell me that was intentional, that "tier" was given to one bakery, and "tear" to the other... and that it wasn't someone taking an order over the phone that misspelled the order. WV: sineromp: Math teachers on vacation. Those pictures are AWESOME! :D Ahahahah. 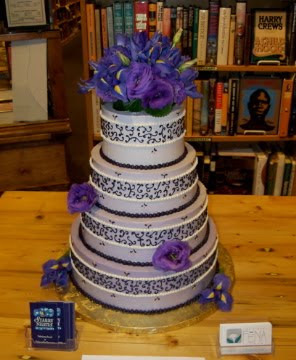 Actually, I love the purple iris and fancy piping on cake #2 the most of all. Like the first commenter, I want to know if they were given the exact same verbal instructions and made the mistake in interpretations, or if they were given two different sets of instructions. Wow. I love the tear cake. Probably my favorite cake seen here so far. Definitely the most bizarre. They are both neat cakes!!! It was just a made-up scenario. They were both going to bring cake anyway and Paul had the idea to try to make it interesting. His inspiration would be if two bakeries got identical phone orders but interpreted them in different ways. It was absolutely fantastic. I was there! I showed up late since I didn't get off work until 7 pm, but I still got to try a little of each cake, but didn't even know about the joke! =P That's great! =) And they did wonderful jobs on both cakes! Very delicious! I'm going to send you the invoice for a new keyboard to replace the one I just splurted water all over. WOW! That first cake is just amazing. Wish we'd had them do our wedding--the cake wasn't wreck tastic but it sure wasn't edible either (pretty but tasted like cardboard). That's just stunning in a classical way. To tier or to tear? Stack 'em high! Mud in your eye! Man, you guys are having a great time. It pains me that I can't make it to your Skokie stop, but I have other obligations. And, I'm currently doing Weight Watchers. AND, I'm diabetic! So, there is my trifecta of reasons why I will need to enjoy from afar only. Fancy piping on the second cake made me LOLOL! I haven't laughed that hard in along time! The tear cake was awesome! That is a sweet eyeball cake. I think that second iris cake is AWESOME! Thanks for coming Jen and John. I had a fun time meeting you. and so far i am cracking up with laughter as i read the book. one idea that could be fun, have category awards for the cupcake entries. like "most detailed", "most identical to original", "most wrecktastic"...etc. the guest bakers did a great job. i tried the mint chip and pistachio honey flavors and they were delicious. The purple cakes are fabulous. Though I'm pretty much in love with the second one. 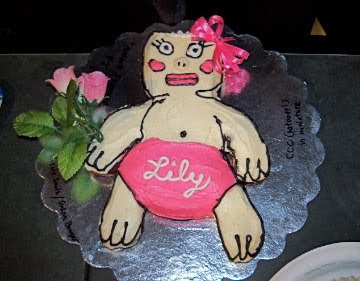 It's a bizarre cake in a good way. The cakes were fabulous and it was so awesome to meet J&J! Both cakes are beautiful, love the concept, and both men are decidedly hot (though Paul is more to my taste). Yay Seattle! Wish I was there,.. sigh,.. please come to sunny California! They both did an awesome job! Did anyone else notice the suggestively placed candle on the doll wreckplica? What a fun idea! Beautiful execution on both cakes! Bravo! And props to the person who made Lap on Fire Barbie. Definitely a classic. I want to know what the 4 tear one tasted like. We know the 4 tier one was raspberry cream, but what about the other? I love them both! NOOOOOOOO! I missed you!!! Those cakes were fantastic! Starry Nights also had a chocolate cake with chocolate mousse filling... It was *amazing*. I'm trying to come up with an excuse to have an event so that I can order one. I absolutely love what happened with the two purple cakes. 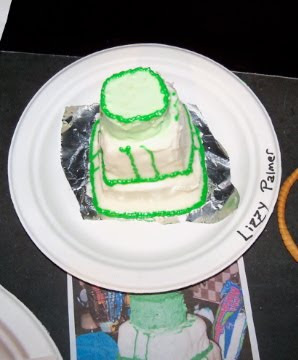 My favorite was when I realized what the second cake artist interpreted "fancy piping" to mean. Classic. This actually has to be one of my favorite posts! Hah! Brilliant! Both cakes are artistic triumphs, in totally completely different ways. I LOVE that purple eye cake! I got a good hard laugh from that one too. And the one thing I thought about the tears, and the "piping" is..
Not only did Paul do a fantastic job of making the cake order fun, he and Matt were absolutely brilliant in its execution! Love both of them for completely different reasons! I'm still amazed by the "wreckplicas!" America's definitely got talent! 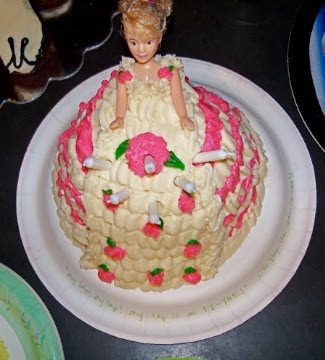 As I type, I'm trying to come up with an occasion for a "four teared" cake with fancy piping. Maybe for the first day of a house remodel? Love it! Yea! My turdaphant was one of your fav's!!! That little kid one, I saw it and went, "That's a dalek." It was very obvious and cute. Both the cakes are great, and the cupcake wrecks are hilarious. Thanks for a chuckle every morning. That was great. Way to go Paul and Matt!!!!!! Haha, Teirs, Tears great I love it. How perfect is that?! Genius! I have to ask...what did those fab cakes cost? I mean, my wedding cake was three tiers, and cost 800 bucks! (it was wonderful, by the way...) Who paid for these beauties? ABSOLUTELY LOOOOOOOOOOOOOOVE THOSE CAKES! The first is totally elegant, beautifully chic! But the second with the eye and the tears and the piping is my FAVORITE! I'd love to have it for my next birthday! My husband laughed until he cried over the "purple iris" cake. He finally asked me not to show him "that cake" again, because every time he glanced at the screen, he started all over. LOL!! That was positively hilarious! 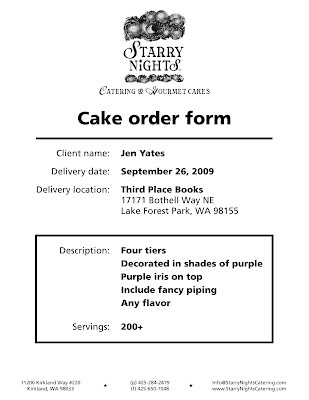 Obviously both guys did an awesome job based upon their interpretations of what was written on the order... that fancy "piping" with the giant purple eye has to be the most interesting cake I've seen on this site. The other, of course, is more standard looking but also nicely executed. (Loving all the purple, which happens to be my favorite color.) Props to both of them! I love the interpretation of the order form, very clever! today was shaping up to be a pretty craptastic day... until i saw today's entry. absolutely brilliant. BRILLIANT! i'm pretty sure some of the folks at work think i'm certifiable after my sudden (rather loud) outburst of laughter after being surly all morning. Oh my word... the "4 teared, fancy piping" cake is hilarious! Brilliant, actually. The best!!! I love the photos of the 2 bakers. FUNNY! thanks for my giggle. ps-can't wait to see what the wreckerators create (or wreckerate) in chicago! I want that purple eye cake reeeeeal bad. I'm trying to make up a holiday as an excuse to order one. Everything about it is perfect. This is priceless!!! I would love to have the eyeball cake with the fancy piping! I've always wanted purple irises. You know I'm afraid that, due to the popularity of CW, bakeries will add options to their order forms like "I'd like a wrecked version" and "Please interpret instructions creatively [X]"
Vote for Paul!!! You Ace of Cakes fans out there BETTER recognize Paul... he used to work with Duff and moved out to Seattle and opened up Jet City Cakes! I'm so glad to see he's doing so well!! Just wanted to say we visited Matt from Starry Night when shopping for wedding cakes. We wanted something a little crazier than what he does but his was by faaaaaaaar the best tasting cake we've ever had. Glad to see him show up on my favorite blog! I love the creativity of both cakes!!! They are awesome!! Gotta say Paul's idea was FANTASTIC. What a creative way to get into the spirit of the whole thing! Those two bakers sure gave you their all, while simultaneously showing off exactly what they can do. Everybody wins! 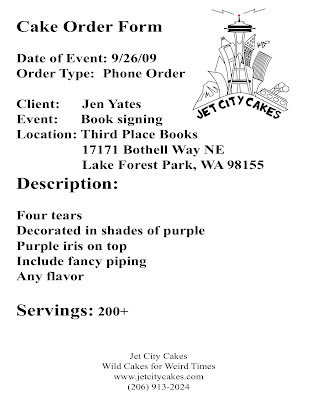 LOL the two purple iris/fancy piping cakes are AWESOME! I like them both equally well. 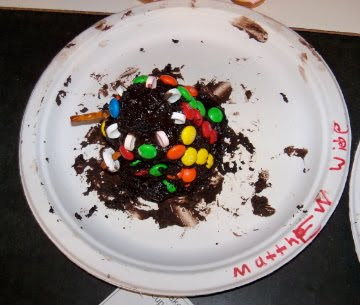 1st cupcake: Gives a whole new meaning to the term "firecrotch". Word Verification: snonte. Looks wayyy too much like snot. And it's written in green. Marvelous! Love the eye on the one cake. Creative minds. Wow, I love how the one little letter can change the entire meaning of the cake order, wonderful! They are both awesome! Awwww, the burning eye of Sauron never looked so pretty. 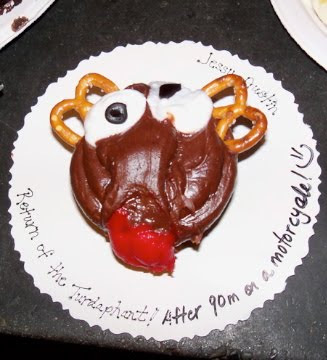 At least the eye cake didn't have purple sunglasses, i.e. shades of purple. One second thought, that would have been really awesome. Those purple cakes are sheer genius!! I love them both. The second one had me howling with laughter, and I love the photos of the two bakers scratching their heads. What clever guys, and so funny. For posters who seem confused, the "two interpretations of a phone order" is obviously an intentional joke. And a very funny one, at that. Love the other wreckplicas, too. WV: emobbed: what the book signings have deservedly been! oh, to have the skill of mr. jet city!!! apparently i already have the sense of humor - when i read the first order i saw the second cake :-) only with an array of fancy pipes (puff-puff) somehow included there! i'm a fan who had to miss your appearance for a wedding shower whose cake i could post as a wreck but i love the bride-to-be too much ~ you'll have to trust me! best wishes on your book sales - can't wait to get mine! mad, mad props to both bakery cakes. Wow. Elegance and AeonFlux-ance. Wish I coulda made a NorCal signing but it was not to be. Did get my books from B&N, though. We had a great time...so glad you did the tour! The cake was scrumptious (especially that chocolate) and you were very funny...we laughed all weekend over the book. Thank you! WOW! Fabulous tier/tear cakes! By themselves, wonderful. Together through collaboration, MARVELOUS! I love the creativity. The cupcakes are also great. 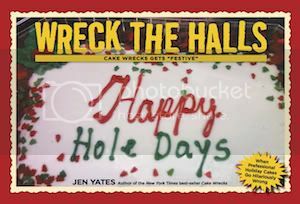 Once again, cake wrecks has inspired artistry and humor to brighten the day. Many thanks to you and all of the bakers. To answer Sandy's question, the cakes were donated by the bakeries. These each would have been hundreds of dollars worth of cake if they had been made for a paying client. ROFLOL! I loved the two phone order cakes. EXCELLENT WORK!!! Since you aren't coming anywhere close to Gillette, Wyoming (Denver is closest at 6 hours away), my uncle went to the Seattle event in my place. I was thrilled when I got a pic on my phone of him and Jen together. Can't wait for him to send me the autographed book!! He's awesome and I'm jealous I missed it! I see you, Glee reference! I absolutely LOVE the pictures of the tier/tear cakes. Well done, I was laughing out loud at the pictures. Oh you cake folk are a keen crew, that is for certain! I need that tear cake in my life. Mum of the Dalek cake maker here...we had such a blast, and my son is still riding the self esteem high from getting into the runners up. The cakes were all amazing. So glad you have recovered - wish you were coming to San Diego, but it's the story of our lives - always skipped in favor of LA or OC. i freakin LOVE the dalek!!! LOVE the dueling purple cakes. Great job, guys. Love the "Dalek" HUGE fan of Dr. Who and this site! Is anyone else feeling a technodrome allusion here?